I’ve seen a dragon in Saint Emilion. Yes, really. I’m not kidding. It’s about 3.30 p.m. on a sunny, warm autumn afternoon in November. We walk uphill into a bosky, oak wood with sunlight filtering through the leaves. The ground is covered in acorns that crunch noisily under our feet in this quiet space. All two tons of bronze on a stone plinth. “Why is there a dragon here?” we ask our host, François Capdemourlin, the Estate Manager at Château Quintus. He tell us that, in mythology, dragons protect treasure or special places. The proprietors of Chateau Quintus in Saint Emilion consider that their 28 hectares of wine growing slopes are special. Hence the protective presence of the dragon, he says. Commissioned by Prince Robert of Luxembourg, President and CEO, Domaine Clarence Dillon and created by Mark Coreth, a world renowned British sculptor, who specializes in large scale, dynamic animal and wildlife sculptures, the Quintus Dragon is spectacular. The view from this wine property is also spectacular. On a clear day such as we enjoy, its possible to see not only famous Saint Emilion chateaux, such as Chateau Angelus before us across the vineyards but also the areas of Pomerol and Fronsac, great wine areas in the distance. Chateau Quintus is owned by Domaine Clarence Dillon, which owns Chateau Haut Brion and Chateau La Mission Haut Brion in Pessac Leognan in the Bordeaux Wine Region. I wrote about Chateau Haut Brion in January: see the Whisper of History. Chateau Quintus represents a relatively new venture for Domaine Clarence Dillon as it extends into creating the more merlot-centric wines of the Right Bank of the Bordeaux wine area through the acquisition of two existing but separate wine properties. Merlot, as the predominant variety in Saint Emilion wines, is the grape variety that gives softer tannins to wines. As we talk about Merlot based wines, we smile as we reminisce about the 2004 film ‘Sideways’ featuring proponents of Merlot and Pinot Noir and wonder how many people remember that film now. Back at Château Quintus there is an aura of calm efficiency about the property. This is a working vineyard: no wine tourist shop or public tasting area in sight. 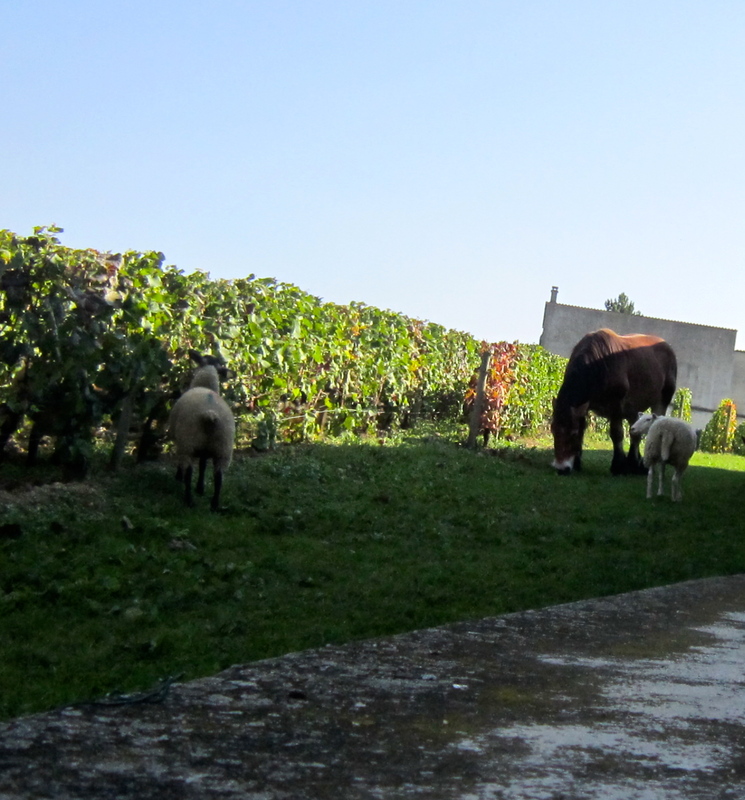 This is the norm in the Bordeaux wine area with only a few exceptions. Visits are by appointment only. Wine tourism centres for this area are located in the UNESCO heritage town of Saint Emilion. We tour the new winemaking area in the renovated chai or vat room and then drive to the Chateau business centre in a different area of the property, where there is a small tasting room. Behind the tasting area, we can look through the glass partition to the wine barrel ageing room where the wine is quietly and patiently ageing. Tasting room with barrel ageing room behind the glass wall. It’s in this tasting room that our host tells us the story about pirates! Images of Pirates of the Caribbean and swashbuckling figures come to mind and I can’t wait to hear the tale. This is what happened. On a diving expedition in the Indian Ocean, off the Island of Mayotte, some years ago, divers found a cache of treasure on the seabed. In this cache, covered with the debris of years on the ocean bed, was a 19th century wine bottle, still intact. On the neck of the bottle was the raised seal of Chateau Haut Brion engraved on the glass, still visible after all these years. Inspired by this historic find, the wine bottles of Chateau Quintus are especially made in the same 19th century style, in this instance with the raised engraved seal of Chateau Quintus. I’ve mentioned dragons and pirates, now its time to mention the wine! Chateau Quintus focuses on red wines and these wines are part of the Saint Emilion appellation. As mentioned, the grape variety grown is Merlot together with Cabernet Franc. In terms of wine production, the vintage has been controlled by Chateau Quintus since 2011. Out of interest, white wines made in the Saint Emilion wine region are characterized as Bordeaux Blanc. We taste a Chateau Quintus 2014 and their second wine, Le Dragon de Quintus 2014. 2014 was a challenging year with a hot Indian summer in the area that saved the vintage after difficult summer conditions. Wine tasting at Château Quintus – note the raised seal engraved in the glass. The Chateau Quintus 2014 is made from 69% Merlot and 31% Cabernet Franc. This is a smooth wine with red fruit and spicy notes. It is a wine to age and enjoy over the next decade or so. Le Dragon de Quintus 2014 is made from 77% Merlot and 23% Cabernet Franc and is a wine with soft tannins and plum notes to fully enjoy now. It is interesting to hear the Estate Manager talk about vineyard management and the wine making process used at Chateau Quintus as it benefits from the expertise of the teams at Chateau Haut Brion and Chateau La Mission Haut Brion, all part of the Domaine Clarence Dillon organization. One example is that the vineyard workers have been specifically trained in the way that Domaine Clarence Dillon prefers to prune the vines. 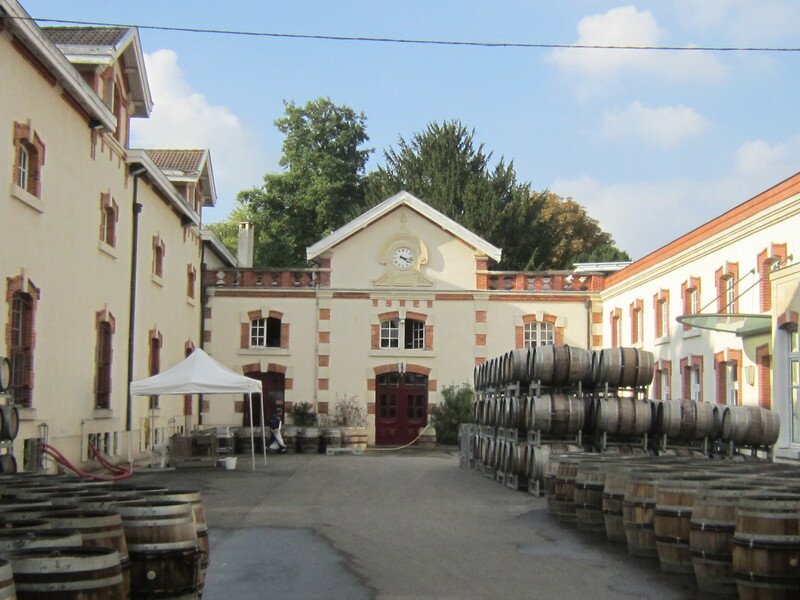 Another is that Chateau Quintus benefits from the on site cooperage or barrel making service resident at Chateau Haut Brion. Yet another example is that the staff from the three different chateaux gets together for the wine blending process to determine the percentages of varieties in the year’s vintage. Team members share their expertise to arrive at the optimum blend. Once the blending has been determined the wine is put in oak barrels for ageing over approximately two years. I am always interested to know about initiatives that develop talent and skill within an organization and enjoy hearing these examples given by François Capdemourlin, who is clearly enjoying his exciting role managing this integrated wine estate. Chateau Quintus is a new name in the Saint Emilion wine world, finding its way and supported by the investment of resources from the Domaine Clarence Dillon. Watch this space, as the pundits say. We’ve enjoyed an interesting and informative visit to Chateau Quintus and its time to thank the Estate Manager for his time, find our car and drive off towards road D33..
D33 is the main road on the way from Bergerac to Libourne and the city of Bordeaux. Up high on the right hand side sits the town of Saint Emilion with its vineyards spread over the hillsides. We frequently drive that road. Now I know where the Quintus Dragon lives, in that bosky wood on the hill high above the road. I know where to look when driving by. Next time, I will raise my hand in a silent salute. Mark Coreth: Check his Facebook page. There are several websites and galleries including Sladmore Gallery in London and Messums Wiltshire that refer to his work. We’re back in Cyprus, land of mythology, of Aphrodite rising from the waves. The goddess of love, known as Aphrodite to the Greeks and Venus to the Romans, was believed to have risen from the sea foam near Paphos at Pétra tou Romioú. Could this be Aphrodite’s sea foam? I remember seeing Sandro Botticelli’s renowned painting of the Birth of Venus (mid 1480’s) at the Uffizi Gallery in Florence and am delighted to think I have seen both the painted interpretation and the physical site of the legend. In this ancient land of Cyprus, where there are records of settlement at the site of the Sanctuary of Aphrodite at Kouklia, site of Old Paphos, dating from the 15th century BC, and where it seems that often the blue of the sky and the blue of the sea merge into one, the imagination can take flight and anything seems possible. Cyprus is a treasure trove of archeological sites with their ancient history. We enjoy visiting these places, and stand in awe of the work and artistry of the people who accomplished so much in those ancient times. In January and March 2013, I wrote about the history of wine making in Cyprus and the mosaics in New Paphos at the Archaeological Park by the sea and those posts are in elizabethsvines archives. 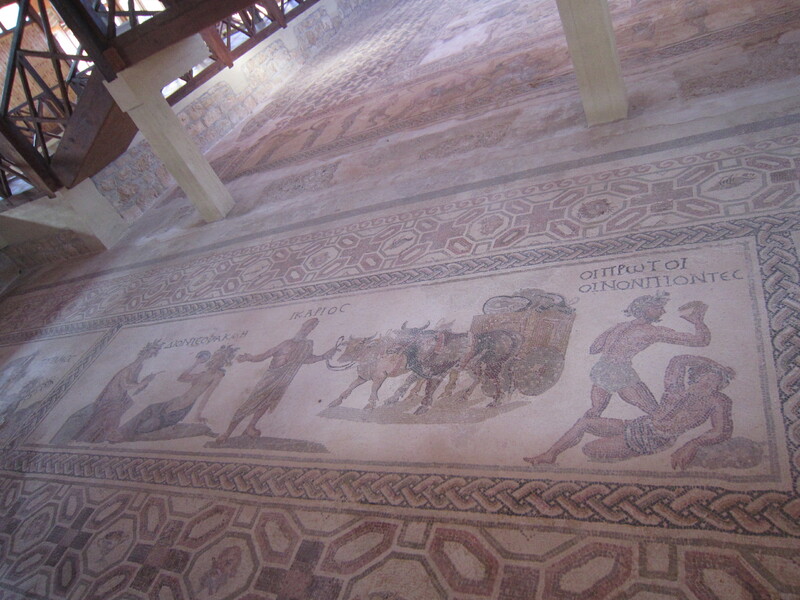 Well preserved and in situ, the Paphos mosaics provide insight into life on the island mainly in the Roman period although there are also examples of pebble mosaics from the much earlier Hellenistic period. Not only do the mosaics illustrate flora and fauna, they also illustrate work related to wine making. I am so interested in mosaics as an art form that I am learning the basics of mosaic making with Sharen Taylor, a highly skilled mosaic artist and conservationist resident in Cyprus. First coming to the island to undertake professional conservation work, she subsequently conducted a two year historical research project of the Paphos mosaics. Now she dedicates herself to the “cultural heritage of mosaic making” working on commissions and teaching students at her studio in Paphos. I have been spending hours practising the seven most used cutting techniques for tesserae ( a small block of stone, glass or wood used in mosaic making) and making a sample board, in much the same way my grandmother would have made a sample project of various needlework stitches. My grandmother was an accomplished needlewoman, as I think the expression goes. I won’t make the same claim for my tesserae/glass cutting skills but it’s fun to learn and try: more importantly it’s humbling to appreciate the immense amount of skill required to make the mosaics of people, animals, and life scenes evident at the archeological sites. All this thinking about mythology, archeology and mosaic making hasn’t dulled my interest in local wines and the local grape varieties of Xinisteri, white grapes and Maratheftiko, black grapes. We will be visiting some local wineries to see how wine making is progressing on the island. In keeping with the art of the possible, the wine industry in Cyprus is enjoying a renaissance and I will share Cyprus wine experiences next time I write. 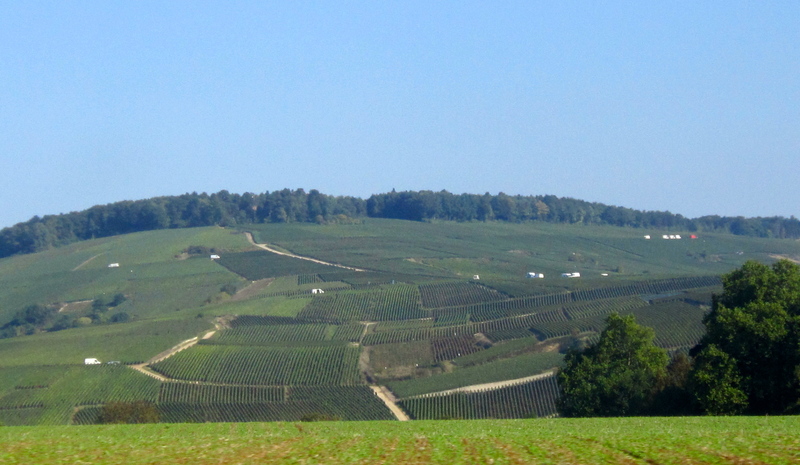 There’s a sense of excitement in the air as we start our drive last October through the vibrant green vineyards of the rolling Champagne countryside. We are going to visit four of the Grande Marque Champagne Houses, see their premises, taste their champagnes and have the opportunity to feel the ambience of these historic businesses. It’s harvest time and everywhere we see grape pickers at work. 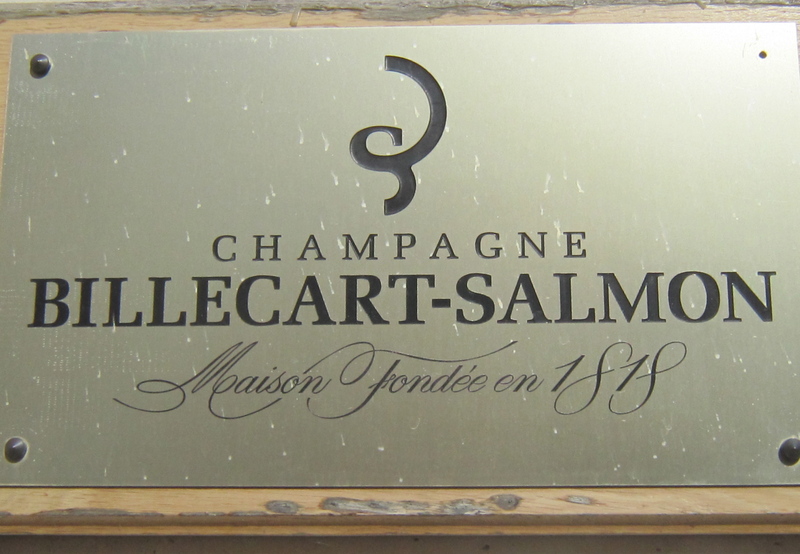 We arrive at Billecart-Salmon, a medium sized Champagne House based in Mareuil sur Aÿ. It was established in 1818 through the marriage of Nicolas-François Billecart to Elizabeth Salmon and is carried on by their descendants. I was first introduced to their champagne a year ago and enjoy the restrained, elegant style. 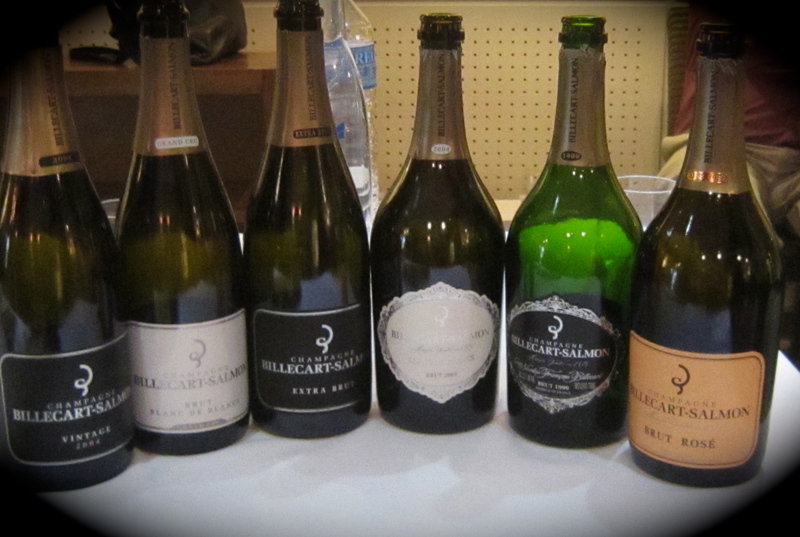 Billecart-Salmon are known particularly for their rosé champagne but offer the full range of styles. At a tasting lunch, we experience their different champagnes with a corresponding range of savoury and sweet bouchées (bite sized offerings) from smoked salmon to chocolate, all elegantly presented in ‘silver-service’ style. We are impressed by their gracious hospitality and their pleasure in providing a full tasting and pairing experience. We visit the cellars where we are interested to see the chalk board listing the different plot harvests. The magic of the grape growing areas come to mind as we read Chardonnay from Cramant, Mesnil, Chouilly; Pinot Noir from Äy, Le Clos Hilaire, Verzenay, Mareuil sur Äy. We also meet some of the younger generation of staff being groomed for senior positions and it is encouraging to see this kind of organizational development in place. We continue our drive through the vineyards towards Reims, the famous Gothic Cathedral town and important hub of the Champagne industry. Our second visit is to Krug at their establishment in Reims. At Krug, the extraordinary attention which is paid by all the great Champagne Houses to sampling, assessing and recording the year’s wines is emphasized to the extent that we understand the skill, expertise and patience that is in every top quality Champagne. At Krug itself, they sample and assess the year’s wines from nearly 250 plots. They also taste again 150 reserve wines from previous years. Each year over 5000 tasting notes are collected and recorded. This work of the Cellar Master, with Olivier Krug – who we had the opportunity to meet – and other members of their Tasting Committee sets the stage for the blend of wines for the year’s Non Vintage Champagne. 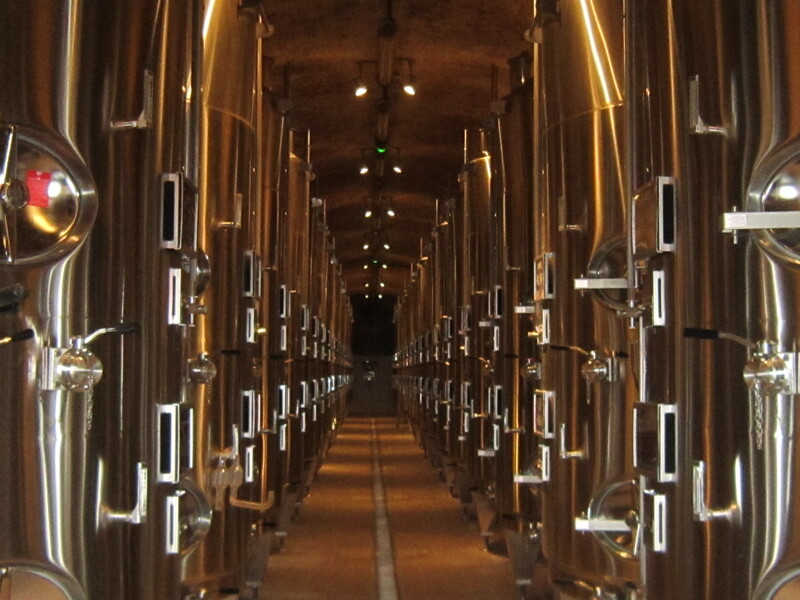 We visit their cellars and see the large number of individual vats for the fermentation of wine from the individual plots, secure within a special space in the cellars. This is before we taste their formidable suite of champagnes. By the end of the day our minds are buzzing with the experience of it all: the countryside, the people we met and their stories, the exhilarating taste of a number of champagne styles, the sights and sounds of the Champagne Region. More than anything it’s the sense of being there, soaking up the atmosphere and experiencing the Champagne heritage. It’s been a great day. Fast forward to January, 2014 and France’s culture ministry has proposed the vineyards, houses and cellars of Champagne for world heritage status (UNESCO) along with those of Burgundy. The proposal will go before the UNESCO World Heritage Committee in 2015. If approved, they will join Saint-Emilion (Bordeaux) representatives of French winemaking on the UN body’s list. We applaud this proposed recognition of talent and tradition. 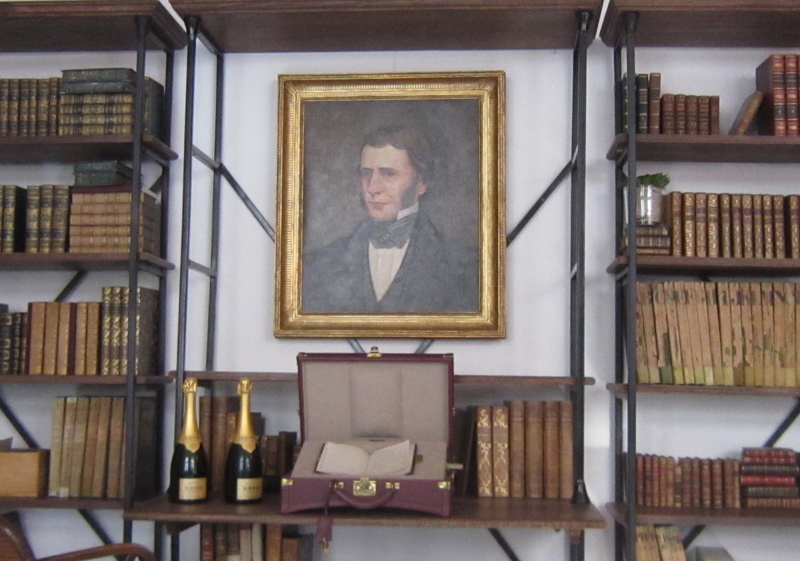 In Optimism in a Bottle post 3 of 3, I describe our visit to Roederer and Bollinger. Late 4th/early 3rd century B.C. This pebble mosaic floor belongs to an earlier Hellenistic building and depicts Scylla, the mythical sea-monster who is part -woman, part-fish and part-dog. She is illustrated holding a ship mast and a trident and is surrounded by illustrations of sea life. Floor mosaic depicting the birth of Achilles. Roman period 58 B.C. – 400 A.D.
A good starting point for considering Cyprus wine-making is in its classical history as illustrated in the archeological site in the old port area of Paphos, a town situated on the south west coast of Cyprus. Paphos is included in the official UNESCO list of cultural and natural treasures of the world heritage. The Cyprus Department of Antiquities manages this site where the past merges with the present day particularly through the medium of the ancient Hellenistic and Roman mosaics. Walking through the entrance-way and up the wide, stone steps to the archeological site, visitors arrive at the open, broad area of excavation of this promontory. 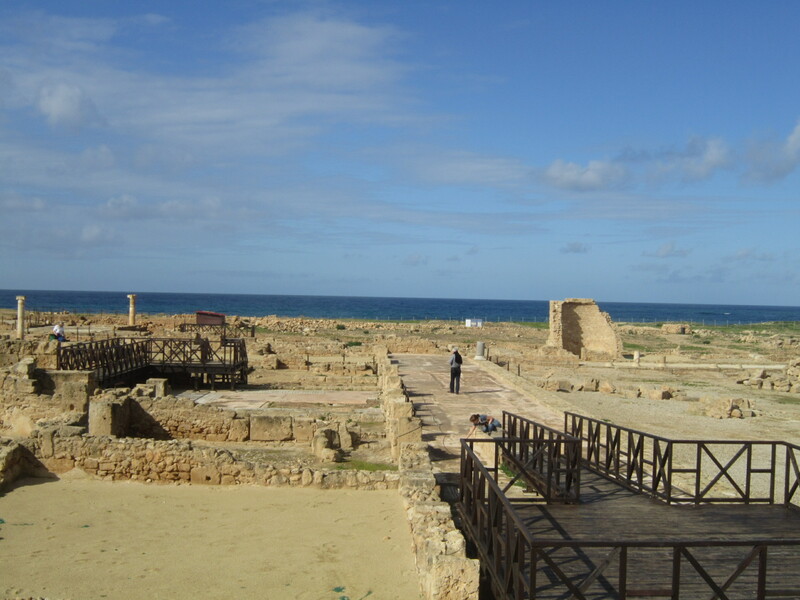 The remains of the town with walkways, broken pillars and stone outlines of rooms are expansive and open to the blue sky which merges on the horizon with the blue, rolling Mediterranean Sea. This strategic site bordering the harbour provides an uninterrupted 180′ view of passing ships. What better way for the Romans to guard their Island of Aphrodite where they remained from about 58 B.C. to approximately 400/500 A.D. There are two areas of mosaics that always draw my attention and wonder. 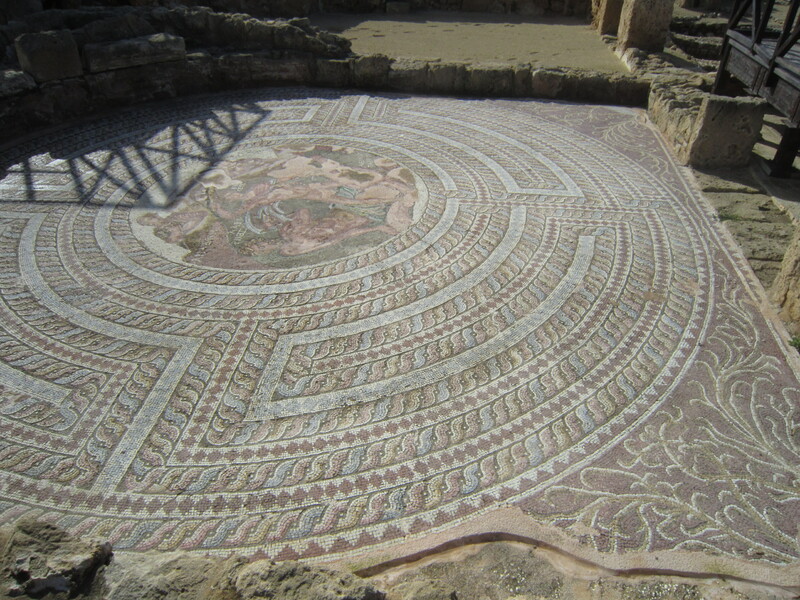 First of all the uncovered circular mosaic floor which is open to the elements. It seems like a contemporary, beautiful carpet that I would love to own. The blues, mauves, pinks, browns are still fresh to the eye in spite of rain and sun over the centuries. 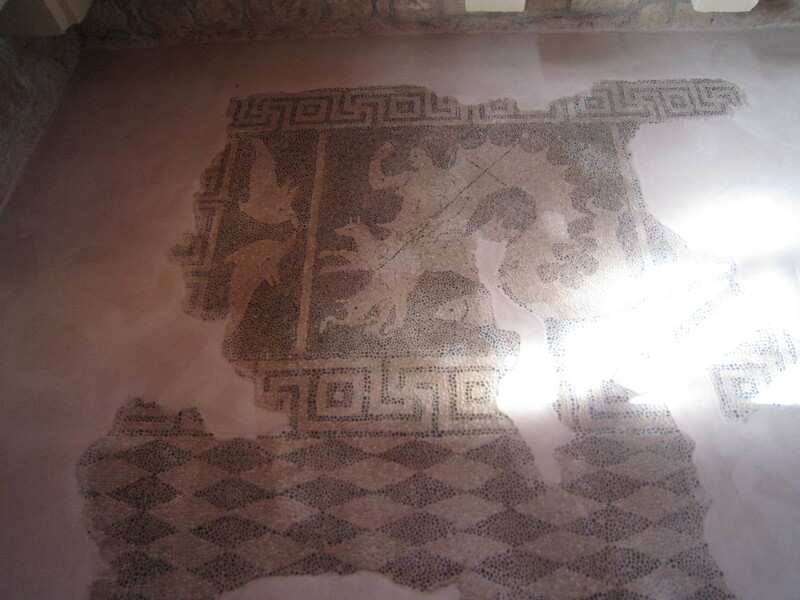 For wine lovers, the mosaic floors around the atrium of the so called House of Dionysos, 2nd – 4th century A.D., are possibly the most intriguing. The remains of this villa are so named after the figural scenes inspired by the Dionysos mythological circle which decorate the reception hall. Here are mosaic patterns depicting the wine harvest with carts overflowing with sacks of wine and there are inebriated shepherds in the picture too! The contemporary appearance of the mosaics and their clarity of colour seem to contradict their antiquity and are a tribute to the skill and creativity of the artisans who made them. Interested visitors often lean over the rails of the raised boardwalk silently and intently gazing at the mosaics. Perhaps they feel as though they are in a time warp. Maybe they imagine that they can hear the sounds of the Roman household going about its daily routine and listen to the untold stories of the people who lived here beside the dark blue sea 1,700 years ago or even in earlier times, as illustrated by the pebble mosaic created centuries before. Fast forward to the 21st century and grapes and grape growing remain an integral part of the Cyprus economy and society. The modern Cyprus wine industry produces a large variety of white, red and rose wines and undoubtedly draws its inspiration from these earlier times. More to come in the next Post.